This photo, titled "Historical Home," was sent to us by Gerry Starks of Tehachapi. The clouds were fabulous March 8, heading down the road past Burger Spot. A winter storm at Joe and Patty Kinn’s house. A bright yellow pedestrian crossing sign stands out in the snow in Golden Hills. A view of a recent snowfall in Golden Hills. There's a good deal of snow in Golden Hills. 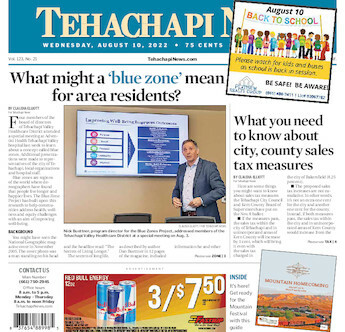 Send your images of life in the community to editorial@tehachapinews.com with a caption and your name. They will appear in a photo gallery online, and we will do our best to publish them in print.